I hand-blend my Happy Hands paraben-free hand cream with shea butter, sunflower oil and aloe vera, especially for knitters, crocheters, spinners & other fiber artists and crafters. It's not greasy or sticky, and will not transfer to your handiwork, I promise. I offer 32 unique scents (vivid, mild or light) plus Unscented fragrance-free... and I include a free sample packet with every order so you can try new fragrances. Sensitive to fragrances? Work in a scent-free office? 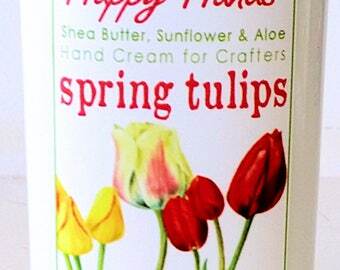 Then this UNSCENTED version of my Happy Hands shea butter hand cream is for you. "Unscented" means that I do not add any fragrance to my hand cream formulation. My base does have a very slight scent of its own, but this dissipates quickly after you apply it. This is the perfect lotion for the office! It is truly unscented, it soaks in really nicely and doesn't leave your hands greasy in the slightest! I love this stuff! help. The fingers are smoother already.